Description:	The AVHRR is a radiation-detection imager that can be used for remotely determining cloud cover and the surface temperature. Note that the term surface can mean the surface of the Earth, the upper surfaces of clouds, or the surface of a body of water. Description:	The Poseidon-2 altimeter, operating at 13.575 GHz (Ku band) and 5.3 GHz (C band), is the primary sensor for the JASON-1 mission. The measurements made at the two frequencies are combined to obtain measurements of the altimeter range, wind speed, significant wave height, and the ionospheric correction. The Poseidon-2 package consists of dual redundant altimeter units each of which has low mass and low power consumption. Description:	The JMR mreasures teh sea surface microwave brightness temperatures at three frequencies (18.7 GHz, 23.8 GHz and 34.0 GHz) to provide the total water vapor content in the troposphere along the altimeter beam. The 23.8 GHz channel is the primary channel for water-vapor measurement and is a redundant channel on the JMR. The 18.7 GHz channel provides a correction for wind-induced effects in the sea surface background emissions, and the 34.0 GHz channel provides a correction for cloud liquid water. The measurements are combined to obtain the error in the satellite range measurements caused by pulse delay due to the water vapor. Description:	SeaWinds is a Ku-band (13.4 GHz) Scatterometer which features a single circular scanning dish antenna to provide pencil-beam measurements, as opposed to the common fan beam design as seen with other spaceborne scatterometers. The pencil-beam design has several key advantages over the more common fan beam design: higher signal-to-noise ratio, smaller size, and superior coverage. The SeaWinds single antenna utilizes twin offset feeds, thus providing two pencil-beam footprint paths with an elliptical sampling footprint of approximately 25 km (in azimuth) by 37 km (in look/range direction); these pencil beams have opposing polarizations (i.e., vertical and horizontal), thus achieving dual-polarization. The SeaWinds instrument provides a full 1800 km-wide swath coverage (including the nadir region), which allows for a nominal daily measurement coverage of 90% over the ice-free oceans. Description:	A satellite altimeter consists of a transmitter that sends out very sharp pulses, a sensitive receiver to record the pulse after it is reflected from the sea surface, and an accurate clock to note the time interval between transmission and reception. Examples of satellite altimeters used in the remote sensing of ocean surface height, wave height and wind speed are Seasat, Geosat and Topex/Poseidon. Description:	The TMR measures the sea surface microwave brightness temperatures at three frequencies (18 GHz, 21 GHz and 37 GHz) to provide the total water-vapor content in the troposphere along the altimeter beam. The 21 GHz channel is the primary channel for water-vapor measurement. It is redundant (21A and 21B). The 18 GHz and 37 GHz channels are used to remove the effects of wind speed and cloud cover, respectively in the water-vapor measurement. TMR data are sent to CNES for processing along with their altimeter data. The measurements are combined to obtain the error in the satellite range measurements caused by pulse delay due to the water vapor. Description:	Radar Altimeter (RA) provides accurate measurements of sea surface elevation, significant wave heights, various ice parameters and an estimate of sea surface wind speed. Description:	The Special Sensor Microwave Imager (SSM/I) flown on board the DMSP F8, F10, F11, F13, F14, and F15 platforms is designed to measure ocean surface wind speed, ice coverage and age, cloud water content, rainfall and atmospheric vertical temperature and humidity profiles. Description:	The AVHRR is a radiation-detection imager that can be used for remotely determining cloud cover and the surface temperature of water land and clouds. Description:	The Poseidon-3 altimeter, operating at 13.575 GHz (Ku band) and 5.3 GHz (C band), is the primary sensor for the OSTM mission. The measurements made at the two frequencies are combined to obtain measurements of the altimeter range, wind speed, significant wave height, and the ionoshperic correction. The Poseidon-3 package consists of dual redundant altimeter units each of which has low mass and low power consumption. Description:	The accelerometer, located at the center of mass of each satellite, measures all non-gravitational forces acting on each satellite. These forces include air drag, solar radiation pressure, and attitude control activator operation. Description:	The two star cameras mounted close to the accelerometer on each satellite provide the precise attitude references for the satellites when making science measurements. Citation ESR. 2009. OSCAR third degree resolution ocean surface currents. Ver. 1. PO.DAAC,	CA,	USA. Dataset accessed [YYYY-MM-DD] at http://dx.doi.org/10.5067/OSCAR-03D01. Journal Reference Bonjean, F., and G. S. E. Lagerloef, 2002. 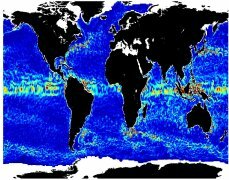 Diagnostic model and analysis of the surface currents in the tropical Pacific Ocean. J. Phys. Oceanogr., vol. 32, pg. 2938-2954.